It was inspired by many trips in to are local blue mountains, with there beautiful trees, majestic mountains and crisp air it’s the perfect get away for my family. Plus we are also on the lookout for wildlife of any variety may it be squirrels to hummingbirds, bears to mighty mountain lions, it’s where my heart is at home. So naturally it was the perfect setting for a mysterious Bigfoot to be lurking about, some people believe in him and some do not! As for me and my family we believe we have seen the signs that no animals I have ever tracked can make. So with this I thought what a perfect design for an easy quilt pattern that is appliquéd . 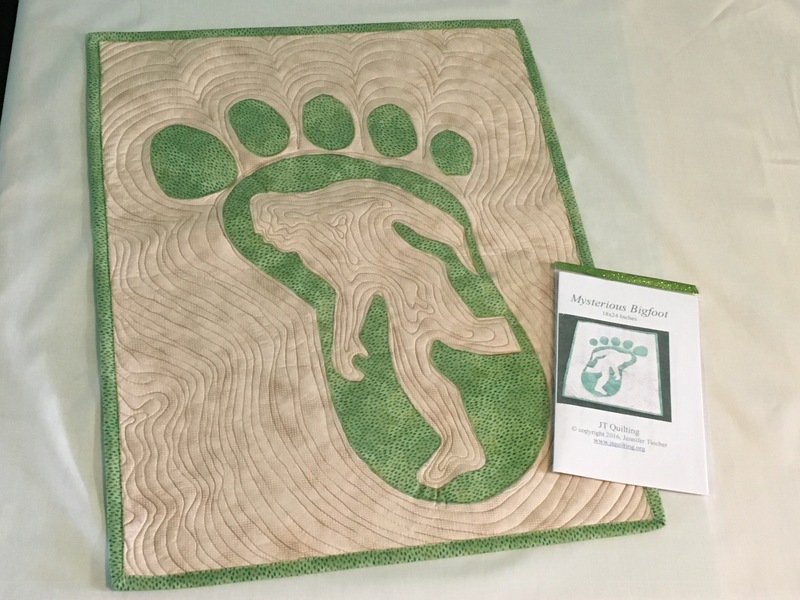 I drew the Bigfoot freehand then added the foot around him to accent the mystery in the design and wrote simple to follow directions to assemble your very own Bigfoot!! A big thank you goes out to all the people who believed in me when I did not believe in myself!! !